Chelmsford, Mass. – March 5, 2019 – Broadcast Pix™ today announced San Diego-based GovTV is using a BPswitch™ MX integrated production switcher to provide turnkey live remote video production of official meetings for the city of Lancaster, Calif. 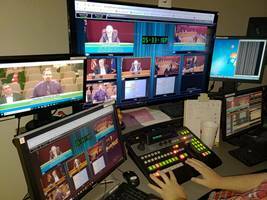 The city is GovTV’s first client to use a new IP-based workflow operated from about 170 miles away at the company’s offices. GovTV is owned by Pacific Design and Integration, a full service systems integrator with extensive experience in broadcast, houses of worship, and government projects. When PDI acquired GovTV in 2015, it inherited a production platform based around a serial control system that, while functional, had issues with internet connectivity and latency that delayed camera control and switching. After extensive research, GovTV developed a new workflow last year built around the BPswitch. The company launched its new system for Lancaster at end of December, and quickly received positive feedback from city personnel. Master control is housed in San Diego. According to Steve Sagday, CTO of GovTV, operators use a traditional Broadcast Pix control surface to switch the live meetings, and can also control and monitor client productions through the Broadcast Pix Commander™ browser-based user interface. A dedicated VPN connects GovTV to its client, allowing system and robotic camera control (as well as seamless insertion into live programming) from San Diego. BPNet™, BPswitch’s integrated cloud-based video workflow service, provides a virtual backup to the VPN. GovTV in San Diego is using a Broadcast Pix BPswitch integrated production switcher to provide IP-based live remote video production of official meetings for the city of Lancaster, Calif.
Lancaster operates LTV, a PEG channel on Spectrum Cable and AT&T that is also streamed by Granicus. LTV programming is played out on a Leightronix Nexus, which allows GovTV to cut into the channel remotely from San Diego with live meetings. The BPswitch mainframe, located in Lancaster, has dedicated inputs for five cameras connected via SDI, plus an electronic voting system, scan converter to display PC-based PowerPoint presentations, and a dedicated video calling system for Skype. The system operates in 1080i HD with SD downconversion for the cable feeds. With a tightly coupled switcher and 3D motion graphics CG, Broadcast Pix provides the most fully integrated live video production systems with patented control and automation technology. From compact units to large-scale, multi-system solutions, every Broadcast Pix features an extensive toolset that makes it easy to optimize and customize your workflows locally and over IP. Plus, its BPNet ecosystem provides secure cloud services and asset management. Founded in 2002, Broadcast Pix has customers in more than 100 countries and is the leader in fully integrated production switchers for government, broadcast, streaming, live event, and visual radio applications. Learn more at www.broadcastpix.com.